Fall and winter are always a more negotiable time of year for renters, as the summer influx of new tenants quiets down, and landlords get anxious to fill their apartments before the deep freeze sets in. But there are even more deals to be had this year, thanks to a (slightly) cooling rental market and a glut of new developments leasing all at once. As a result, concessions were already unusually high in the summer, with Citi Habitats reporting them on a whopping 19 percent of deals in August. 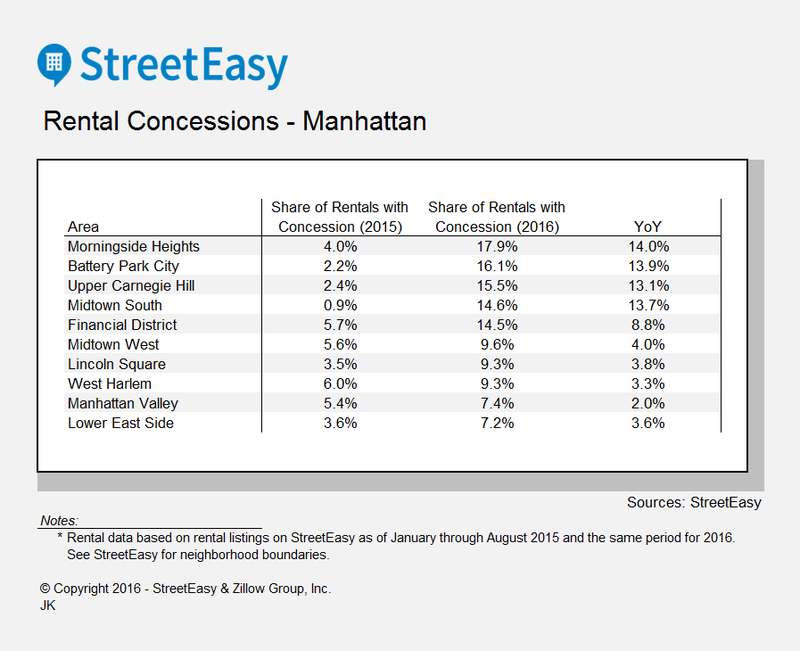 "Since this time last year, we have observed a notable increase in the share of concessions in Manhattan and Brooklyn," says StreetEasy economist Krishna Rao, whose firm noticed the same trend. 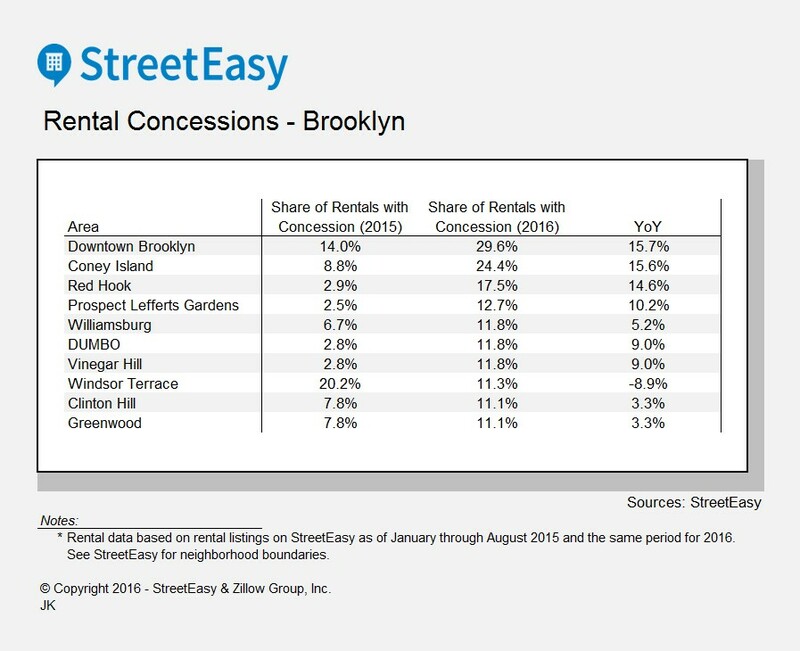 "In some markets like northwest Brooklyn, we are seeing twice as many concessions as last year. This is a remarkably fast increase, suggesting that brokers may be facing an oversupply of units and must now use these tactics to fill them." 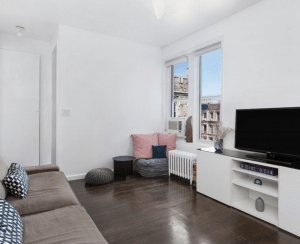 And agents agree: "The deals are definitely out there," concurs Citi Habitats agent Santiago Steele, who adds that they're a better alternative—for landlords, anyway. "From the landlord's perspective, they don't want to lower their rents because they have investors and financing to worry about that are contingent on making a certain rent roll." So it's better for their bottom line to give away extras like a waived broker fee or a couple of months of free rent, rather than lowering the official rent that's on your lease. 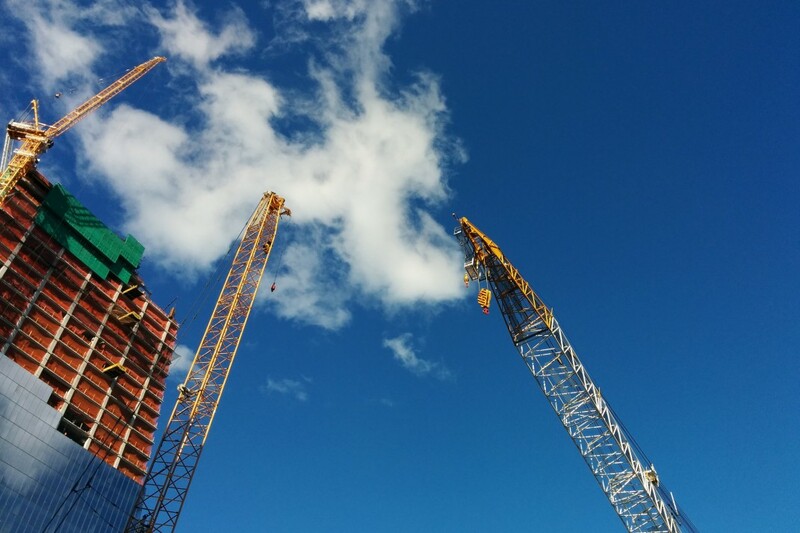 "It's kind of to the point where everyone who's rolling out a new building is offering two months free rent and no broker fee," adds David Maundrell, Citi Habitats' executive vice president of new developments for Brooklyn and Queens. While many new developments are as shiny and up-to-date as advertised, there are some unscrupulous companies out there who have slapped together buildings to take speedy advantage of the market, resulting in situations where renters are shelling out exorbitant prices for a spot in a building that's barely livable. As such, it's always a good idea to Google the address, the name of the landlord, and the name of the developer before moving in (more tips on that here), and to tour the place in person to check for telltale signs of haphazard construction, such as unevenly attached fixtures. Also, be sure to check that the building will indeed be complete by your established move-in date, and ask if all amenities will be available right away. "I would look at the areas where the most supply is coming on," says Modern Spaces CEO Eric Benaim. 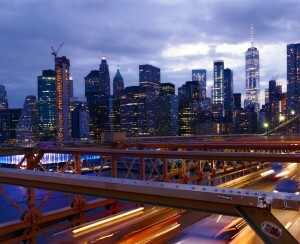 "I would say the top three markets I'd look at if I were a renter right now would be downtown Brooklyn, Williamsburg, and Long Island City, which all have a significant amount of units coming online over the next year." "Because there are all these units coming on the market, there's a need to absorb them, and competition between developers," says Benaim. 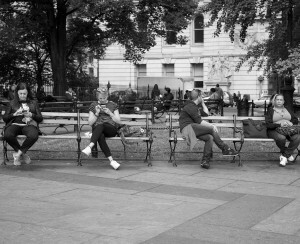 And competition between developers tends to translate into deals for renters. If you're scoring a month or more of free rent, this will require some planning, as you'll usually get the discount up front (or later on) in the lease, rather than as a consistent, discounted monthly "net effective rent" as advertised in the listing. "When you're planning your budget, don't think about the month's rent, think about your total cost per year," says Steele. "Put it on a spreadsheet and plan it out that way." In other words, plan out your budget with the entire year in mind, so you don't get overconfident with your first month (or months) free, then wind up blowing your budget down the line. "And make sure that you can really pay the gross rent when the lease is up," adds MNS CEO Andrew Barrocas. You'll also want to calculate to see if you need a guarantor, which may well be true if you're looking in a high-priced rental, with the standard requirement that you earn 40 times the montly rent. "Think how few people can actually qualify for a luxury building where the rent is $4,000/month for a one-bedroom," says Charles Schoenau, managing director of Insurent, an institutional guarantor that works with new developments across the city (and a Brick sponsor, FYI). "You'd have to be making $160,000 a year." 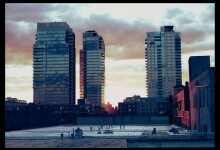 And be sure that you base all calculations on the gross rent, for instance, the actual rent that will be on your lease. "People try to petition that the rent is only the 'net effective rent' once the concessions are factored in, but really, what your guarantor is guaranteeing is 12 months of the gross rent," Schoenau explains. In a market like this one, there's room for some negotiation, and here, it pays to think strategically, whether that means angling for a longer lease, a lower security deposit, or even an extra month (or two) for free. For starters, says Benaim, some developers like TF Cornerstone are giving the option of putting down just $1,000 for a security deposit, lowering your up-front cash expenditure. 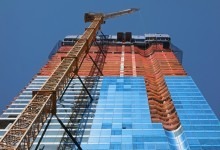 Rather than the traditional first month, last month, and security, he says, "Newer buildings may let you do just the first month's rent and a security deposit," he says. "I'm finding that some landlords will grant additional free rent on the second year, so that's something you can try to negotiate," advises Steele. "You can say to the landlord, 'I'd like a longer lease, with an extra half-month rent on an 18 month lease, or extra two months free rent on a 24-month lease." 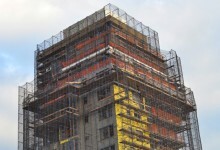 "We're really trying to be as creative as possible, and are open to doing what it takes to make the deal," says Isabella Nguyen, vice president of leasing and operations at Clipper Equity, which is currently offering up to three months free rent on apartments at Parkside Brooklyn in Prospect Park South. "For a year, we'll cover the broker fee and offer two months, and for a longer lease term of 24 months, we'll go up to three." She also notes that they're flexible on how the free months of rent are doled out—for instance, one at the 12 month mark, and another at the 18-month mark. Even if you're not getting extra rent up front, says Benaim, you may want to think about the length of your lease. "You could potentially negotiate your lease to be maybe 13 or 14 months, so it's ending next November or December, and coming up for renewal at a more negotiable time," he suggests. Particularly if you're willing to move in immediately, many developers might be happy to budge on this front. "From a negotiation standpoint, your ability to rent today and take occupancy as soon as possible is ultimately going to get your the best deal," says Brian Weiss of Triumph Property Group. "If you can walk into a leasing office and say 'I'll start the lease on Monday if you give me my terms,' chances are you'll get a more favorable deal than if you push it back a week or two." Ultimately, this concession overload will likely lead to landlords just giving in and lowering rents, but likely not any time over the next couple of months. "Eventually I think this is all going to stop and people are going to lower rents," says Maundrell. "The rental market has been so hot for so many years, and it will be a re-training of the market." And really, there's no greater concession than cheap rent.